James F. "Skeets" Coleman test pilot Coleman was born in 1918 and joined the US Marine Corps in 1941, becoming a fighter pilot flying dive bombing missions. After World War II, he joined the Marine Reserves and graduated from UCLA in 1947. He worked for North American Aviation, Aviation Values Corporation, Business and Commercial Aviation Magazine, the Fairchild Aircraft Company and the Convair Division of General Dynamics. 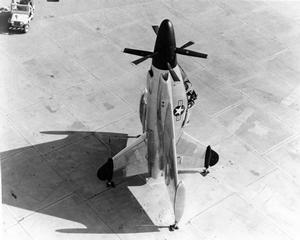 At Convair, he was an engineering test pilot and flew their XFY-1 “Pogo” VTOL fighter. 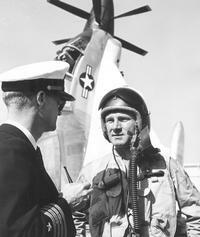 He was the first pilot ever to accomplish a fixed-wing vertical takeoff, transition to forward flight, and back to a vertical landing, for which he was awarded the 1955 Harmon Trophy. He made the first tethered flight on April 29, 1954, and conducted hundreds of tethered vertical take-offs and landings, racking up more than 60 hours of flight in Airship Hangar Number One at Moffett Field, California. His first free vertical hover was on August 1 and the first transition was conducted on November 2. He continued to fly it until June 1955; the program was shut down the following year. James F. "Skeets" Coleman passed away on May,13, 2014, at the age of 95 years. to find his obituary AHS Update: Vertiflite Jul/Aug 2014.